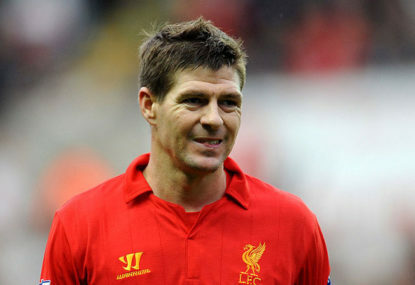 Steven Gerrard is playing abroad, but is certainly no longer in his prime. The 2013/14 English Premier League season kicks off tonight with a fixture between Liverpool and Stoke City. Join us for live scores and commentary from kick-off at 9.45pm AEST. After a four-month offseason, both sides will be champing at the bit to get out on the pitch and start their respective seasons with a victory. Liverpool are the clear favourites, and their recent form has been impressive, winning six out of seven of their preseason friendlies – against the likes of Olympiakos and Melbourne Victory. Their most recent game was a close 1-0 loss to Celtic just over a week ago. The Reds finished the 2012/13 season strongly, losing only one of their final 12 games to finish the season in seventh spot, narrowly missing European qualification. Stoke had a quieter offseason, touring in the US and having mixed results, such as a win against FC Dallas but a 2-0 loss to Houston Dynamo. In 2012/13 the Potters finished in 13th, and also topped the league in drawn games. In their two games last season, the teams played out a 0-0 draw at Anfield where Liverpool dominated possession but couldn’t find the back of the net. Later in the season at Britannia Stadium, Liverpool took the lead in the second minute courtesy of a Steven Gerrard penalty but Stoke ran away with the game from that point to win 3-1, including a brace from Jonathan Walters. Stoke’s opening day side should be largely the same, with one major change being a new manager, Mark Hughes (formerly of Manchester City). The players to watch for the Potters are captain Ryan Shawcross and forward Peter Crouch. Liverpool have had some turnover – winger Stewart Downing (91 appearances) is leaving for West Ham, and centre-back Daniel Agger is perhaps close to moving on after Barcelona submitted an offer last week. However, all the news in Liverpool is centred around one player – striker Luis Suarez, who stood out last season for good and bad. Suarez finished the season with 23 goals (second in the league, and third of Liverpool’s total) and was named to the PFA Team of the Year, but was suspended for ten games for biting Branislav Ivanovic. The suspension will keep Suarez from playing against Stoke. The Suarez saga continued over the offseason, as Suarez was forced to train on his own until he publicly apologised for his claims of Liverpool’s broken promises. For his part, Suarez is determined not to come to any reconciliation, and was linked with a possible transfer to Arsenal, but team owner John W Henry mentioned recently that he is equally determined not to sell Suarez. The game kicks off at 9.45pm AEST and join us for live commentary on The Roar.